The Combination Cash Box can be set to any combination you want. A unique design with a four-bill compartment built right into the cover. Opens flat for easy ergonomic use. 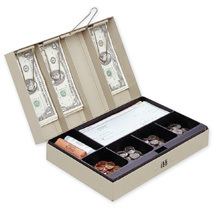 Removable six-compartment cash tray that can hold: loose coins, cash, receipts, or rolled coins. Storage underneath for additional currency, documents or checks. Three-digit combination lock keeps valuables secure. Durable heavy-gauge steel construction with scratch and chip-resistant finish that stands up to everyday use. Convenient steel carrying handle for easy transporting.